Allspan temporary covered walkways are versatile and offer numerous options to suit all requirements. 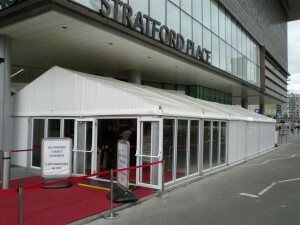 They can be designed and built to your specification, as can our temporary structures. Please see below for some of the options available for your temporary walkway structure. Our range of stylish temporary structures and walkways offer ample space for greeting guests in true VIP fashion. For certain events, a place to greet your guests before they enter the main venue is a necessity. This could be a ticketed event, with added security checks and/or a cloakroom. It could be an Awards Ceremony or Film Premiere, where paparazzi, fans and onlooker might be present. Either way, your event must look spectacular! 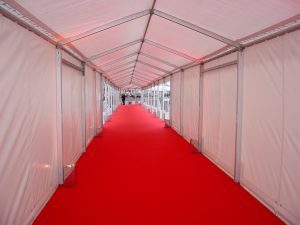 Allspan event walkways can be further styled with a luxurious red carpet, event lighting and other accessories to guarantee the very best first impression. Walkways for venues can offer a seamless transition from a permanent building to a temporary structure, or an adjacent property. They can be built to your desired width and length and, when styled and enhanced with the right lighting, visitors can often believe the walkway and temporary structure are in fact part of the main venue. Walkways for venues can also commandeer a smart queuing system at popular tourist attractions, or to protect guests from the elements as they travel from one site to another. PVC wall panels can be fitted to your Walkway for added protection against the elements, or the sides can be left open – you choose! Unfortunately, we live in time when security must be a key consideration when planning a public or private event, when entering a popular venue or even shopping. At Allspan we supply security tents and walkways for all sorts of reasons. Fortunately, we have a range of temporary structures to suit all locations, including shopping centres, event venues, car parks and tourist attractions. If security plays an important part in your business, or you are looking for a luxurious walkway for your VIP event, please do not hesitate to contact our team. 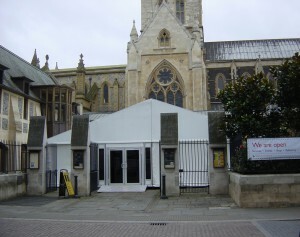 For more information about temporary structure hire, please click here.